Narrative Art tells a story. "It's a cat. A cat with angel wings. Dead cat? Am I painting a dead cat? No. Cat's have 9 lives. Lucky ducks. Humans have only 1 life. Man, I'm getting old. We should treasure every day. Treasured ...oooh I have a rub-on that says that!" But to start off I wasn't thinking of anything but how pretty my StencilGirl prints were looking as collage fodder as I tore them up and glued them down onto the canvas. Then I used a credit card to scrape acrylic paint on evenly and thinly. 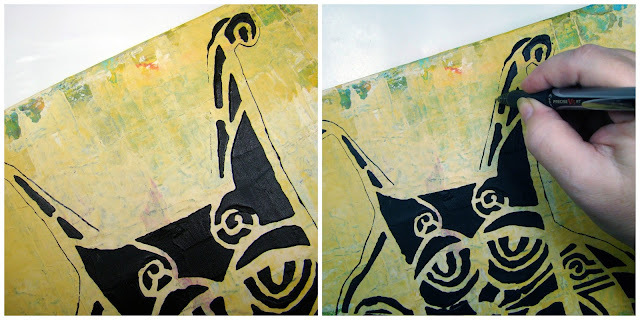 I love that the collaged papers has bumps and wrinkles letting the paint skip and glide across the canvas letting color and prints reveal itself in unexpected places. Letting things dry in between steps tries my artistic muse to no end but since I was combining 2 stencils together using molding paste meant waiting for one to be completed before working on the next one so I wouldn't smudge anything. Plus you really need to wash off the molding paste off your stencil as soon as possible or at least soak them in a tub of water. Now Scrappy Cat by Suzi Denns is "supposed" to be popped out of its stencil. But for whatever reason, I have chosen to keep it whole which means I get this cool outline which sometimes may skip here and there but easily fixed with a pen. 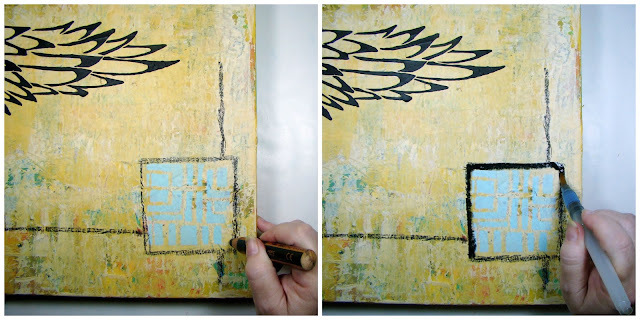 I applied acrylic paint through the stencils: Ancient Marks stencil by Suzi Dennis and 429 stencil by Mary Beth Shaw with a cosmetic sponge, taping off a square shape and a rectangular shape on the stencils themselves. I also added some mark marking with a Sharpie and a Stabillo and making loose outlines with a pen to create a "Modern art" style background. Repeating the same colors and patterns on both sides of the canvas for a balanced look. Sandee you make me laugh! Love your thought process and this canvas. I have to say it’s one of my favorites and I’m a dog person... never thought if stiching in a canvas before. Now you’ve got my mind reeling! Love what you did with these stencils! Love your explanations about the techniques you used! - Makes me want to jump in and create! So well done!!! You made me laugh! Thanks for your inspiration...as an oil painter, former art educator, and mixed media LOVER ....I so love seeing what others have done with elements and tools...keep going ! You know I am a DOG girl... but nobody makes me appreciate CAT ART like you!! Love this and all its crusty bit artsy goodness layers.. LOL great job!! What a hoot! Your playful spread just brings a smile to the viewer’s face. You combined stencils so creatively.